You know the Ducks on the football field. You know the Ducks on the track. The Men’s Basketball team went far on a national stage. Which team has caught my attention? The No. 3 Oregon Softball Team has. They are set to host their first NCAA Super Regional, after making it last year all the way to the College World Series. Starting Saturday the Ducks will take to the diamond at Howe Field against the Big Ten runner-up Huskers. I started this post with a mention of some of the more recognizable teams at Oregon, but what makes Eugene a special place to be a sports fan is the unwavering support all the teams receive. This is especially gratifying to me as someone who has worked hard as part of the Oregon Pit Crew – the Ducks student section – to create more awareness for all women’s teams. 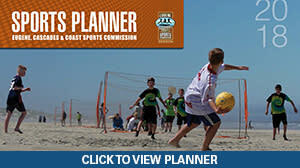 This goal of packed crowds for volleyball, softball, and acrobatics and tumbling is coming to fruition. 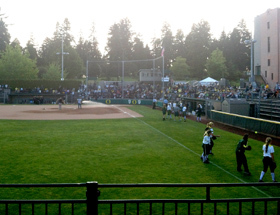 To contain the crowds last year, temporary bleachers were erected beyond the left field fence to pack as many Duck-crazy fans into the park as possible – and that is exactly what happened. I was huddled around Ducks from various teams, students, and other fans quick to yell out in support of this powerhouse team. They all came to cheer on a tremendous group of Ducks. Jessica Moore leads the way after being named the 2013 Pac-12 Pitcher of the Year for the conference champion Ducks. She is joined this year by five teammates who were also honored on the All-Pac-12 First Team. Howe Field is a special place for me to watch the game. Not only is the field kept beautiful – with a giant yellow ‘O’ in center field – it sits next to my favorite location on the University of Oregon campus. McArthur Court created one of the largest home court advantages in the nation for Oregon Basketball and now, with Mac Court watching over, the same is happening next door as the softball team has begun a dynasty at Howe Field. A trip to Oklahoma City for the College World Series last season was a pleasant surprise, but this year the Ducks have their eyes set on a much bigger prize. It all gets started Saturday with the Eugene Super Regional at 5 p.m.
About the author: Grant is no stranger to sports in Eugene having worked closely with the Oregon Ducks, the 2012 U.S. Olympic Track and Field Trials and the Eugene Emeralds during the last three years. The Oregon Ducks ‘Quack Cave’ social media command center is a second-home, along with the first row of Oregon Ducks games as a leader of the official student section, Oregon Pit Crew.